Welcome. 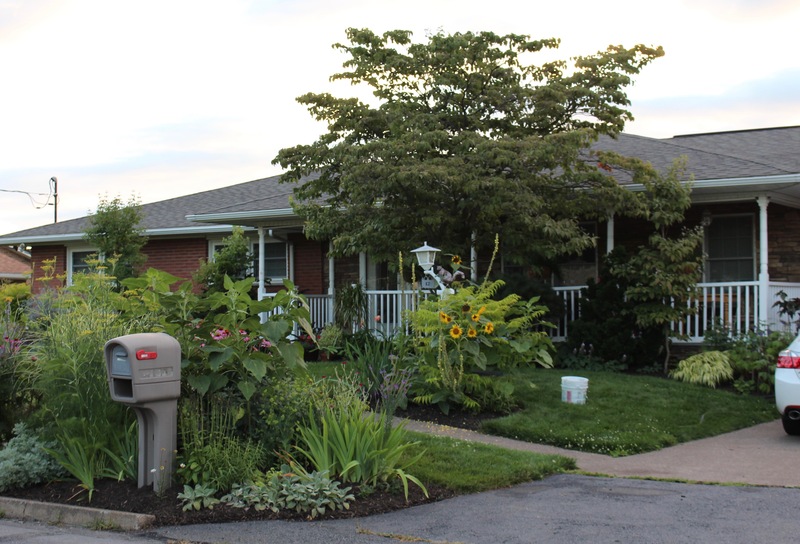 Look at that mulch… ok, enough of that… the other first thing you’re likely to notice is the thicket of a garden out front. It’s colorful but I don’t know if it does much for the house’s curb appeal. Before getting too into the tour, I feel like there’s always something distracting going on at our house. Tools, buckets, hoses, construction debris, and unfinished projects may appear at any point so consider this your fair warning. The garage cleanup is wrapping up this weekend. Much of it just moved around but the new paint and big boy steps towards neatness are gradually making this into a space which doesn’t scare visitors or embarrass homeowners. Surprisingly enough there were no run-ins with the law these past few days. With the garage cleanup underway I was nearly positive there would be a visit from the EPA concerning the destruction on such a massive scale of vast areas of spider habitat. There were also no emergency room visits. I thought for sure when I broke that 6 foot bathroom mirror there would be some bad luck involved but so far just the usual. Let’s get going though. Here’s the foundation border as you proceed around the house. During last year’s dry spell I officially gave up on this bed, but recovery has been swift. 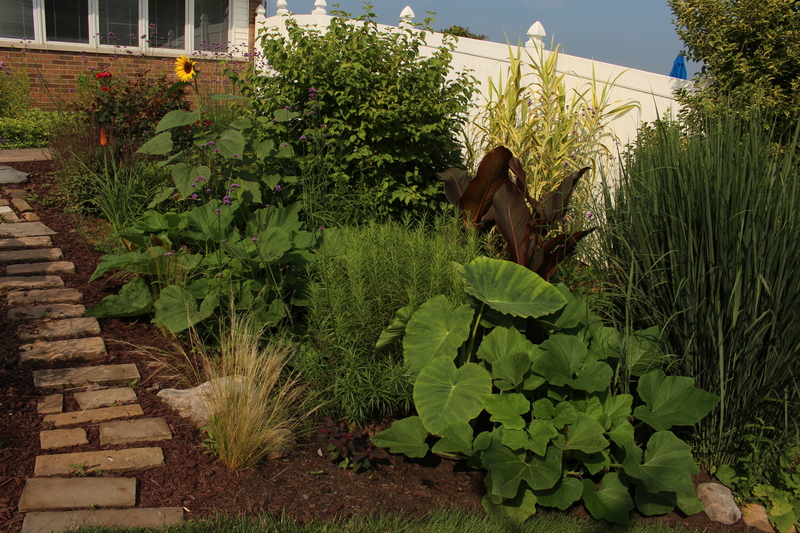 Although it’s still a little “wooly” for a foundation planting I do think it’s coming along, even if sunflowers and 9 foot tall mullein don’t exactly go with the spiral-cut arborvitae. The front street border shows up enough on Tuesdays so here’s just the very end looking over at the neighbors. I snuck a few white ‘Annabelle’ hydrangea into her mulch beds but the blue ones are all her. Amazing what ample rain can do for a hydrangea. At the end of the front yard looking toward the neighbor. The golden juniper is about where my property ends. I don’t know when I last showed the south side of the house. It used to be covered by overgrown yew but two years ago I cut them back to the base and since then they’ve come back fine, but in the meantime I’ve filled up the dry, rooty space in front of them with all the odds and ends of my seed starting experiments. In case it’s not obvious I call this my rock garden despite the fact there are no rocks and it’s mulched with shredded bark. As we enter the back yard we pass last year’s Tuesday View, the tropical garden. Rounding the corner the backyard comes into view. Look at that green grass! 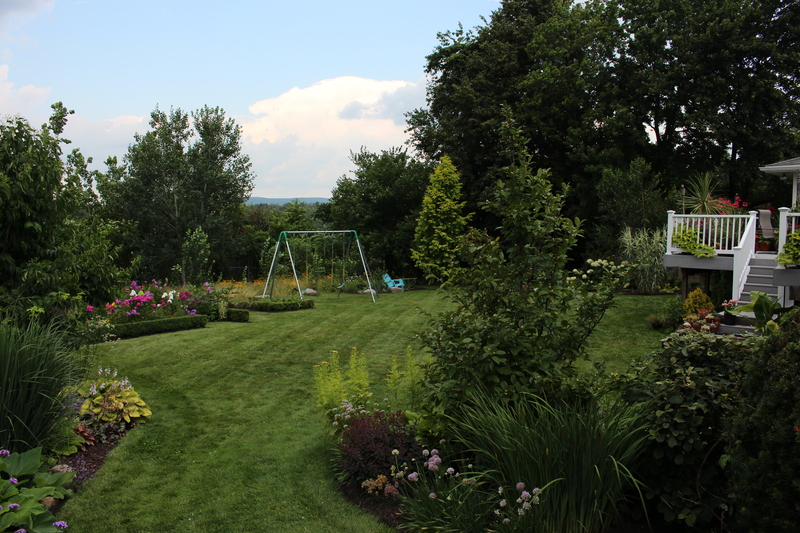 Potager (aka vegetable garden) around to the left, meadow behind the swings, deck and house to the right. 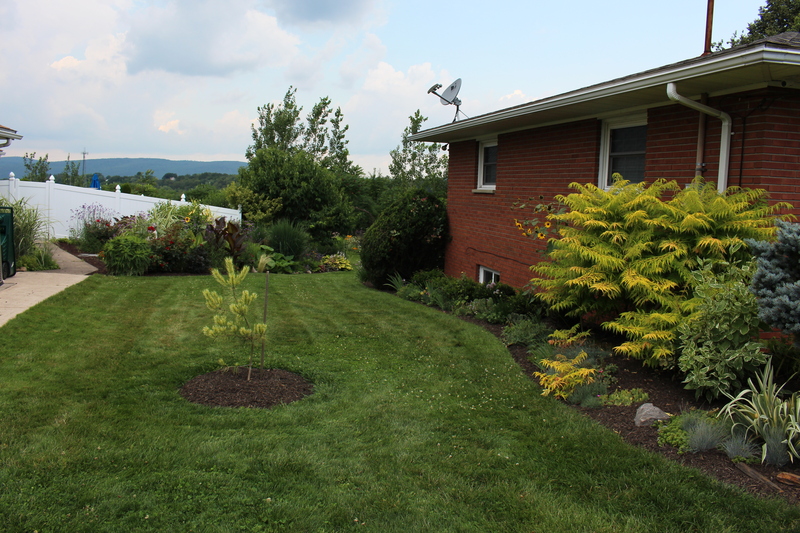 A quick glance to the right at the new lawn which replaced my most hated failure of a flower bed. 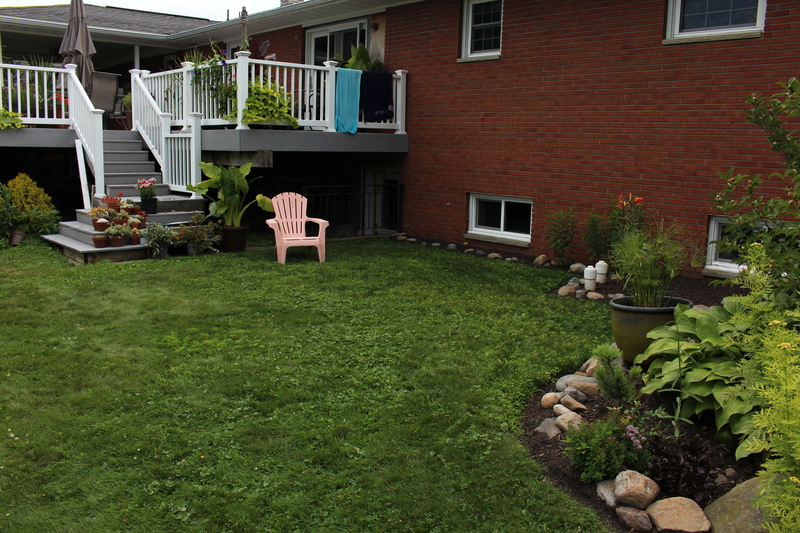 I’m so much happier with this area now, even though the world really doesn’t need more lawn to mow. The plan called for finishing off the deck in May, but the planner got distracted by the garden and ended up ripping everything out of here and planting grass instead. This area has no name but please don’t let all the rocks confuse you into referring to this bed as the rock garden. Here’s a closer look at the ‘potager’. Whoops. Wrong year. I was wondering why several phlox ended up not returning this spring until I remembered how the garden looked last summer. Here’s the view almost exactly a year later. Don’t judge my love for little hedges, it’s the only thing keeping this area neat, and I actually sort of enjoy trimming them. The potager is officially the part of the garden which requires the most work and unfortunately I don’t provide it. Chaos develops… well I guess chaos never “develops” it just degenerates… but something happens, and the flowers generally do their own thing and if we’re lucky a vegetable finds its way out every now and then. I have no problem supporting my local farmer after seeing how much work it takes to bring a broccoli from seed to soup. Two things of note though are the marigolds (I needed lots of marigolds this year) and yellowing potato tops near the front mean something edible finally cometh. I promise to limit my comments on the precious phlox. They’re a favorite even though several clumps went to phlox heaven last summer. Who says phlox seedlings are bad? I got lucky and there are several nice ones here to replace the casualties. ‘Cabot Pink’ is front and center and a sprig of ‘Salmon Beauty’ is off to the right, but the rest are volunteers which (should) be moved to new locations this fall. 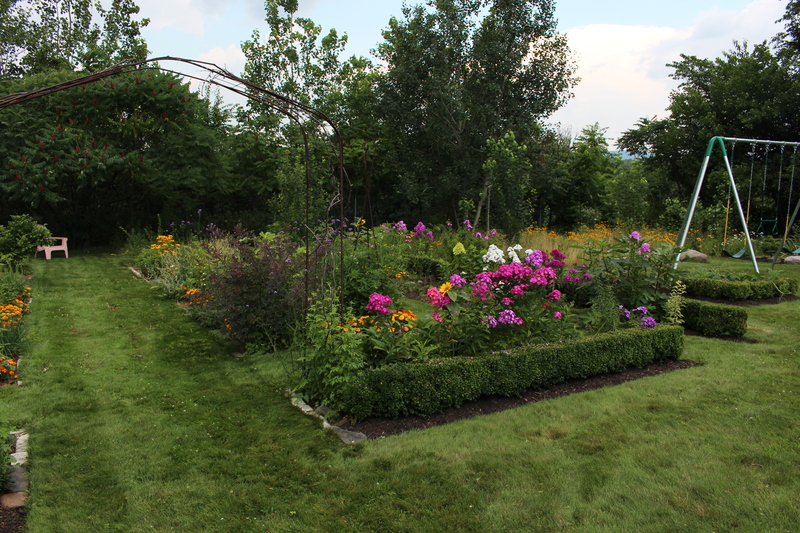 A few more phlox as we move on over to the meadow garden. Some more phlox and seedlings. Athough the colors are more average I can tell the pink in the center is a ‘Blushing Shortwood’ seedling since it shares the same rounded flowers and slightly reflexed petals. 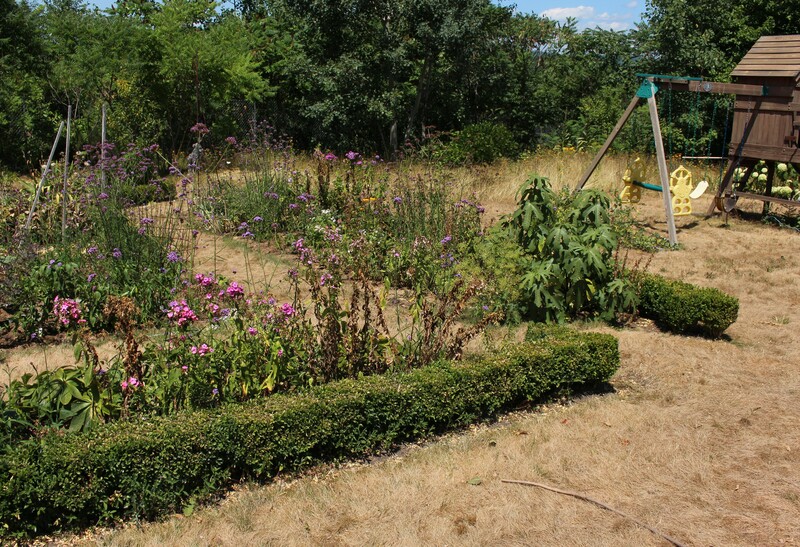 The meadow garden is beginning to look a little unkempt as the grasses continue to grow rather than politely drying up in the summer heat. 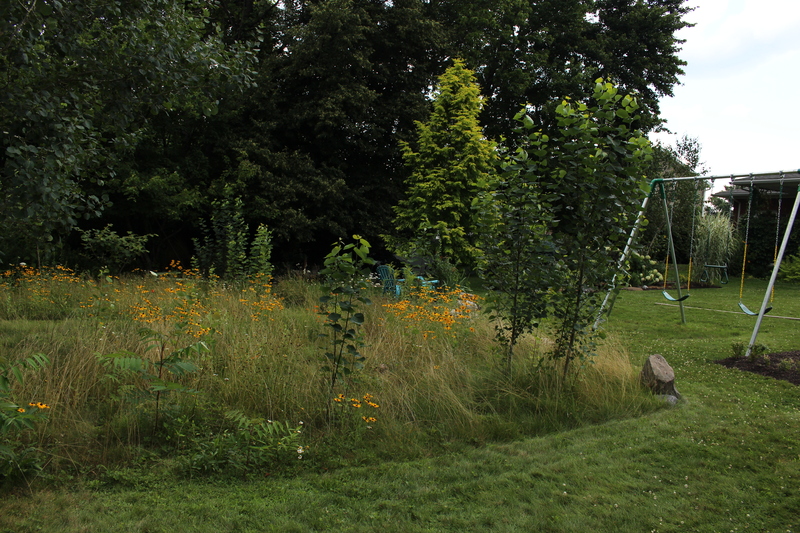 For now I’m hoping the golden rudbeckia flowers are enough of a distraction for minds which crave neatness all over. Moving past the swings and looking back, the neat hedge really does a lot to tame the messiness. In complete disregard for plant health and proper timing I finished off the new swingset bed with a section of hedge transplanted from the back of the potager. Just to be clear, sweltering 90F days in July are not recommended for transplanting boxwood, but I guess we’ll score one more for stupid ignorance. This is so neat and trim it’s almost sickening. Although it’s nice to have a spare boxwood hedge growing around, this one only covered about half the section. As luck would have it though, there was also a tray of rooted cuttings to fall back on. To be clear on this as well, it’s generally not a good idea to root cuttings you don’t need and then throw them under the deck for at least five years while you wait for something to happen… and that ‘something’ also happens on a 90F sweltering July day… but as usual we just carry on and ignore what should have been. 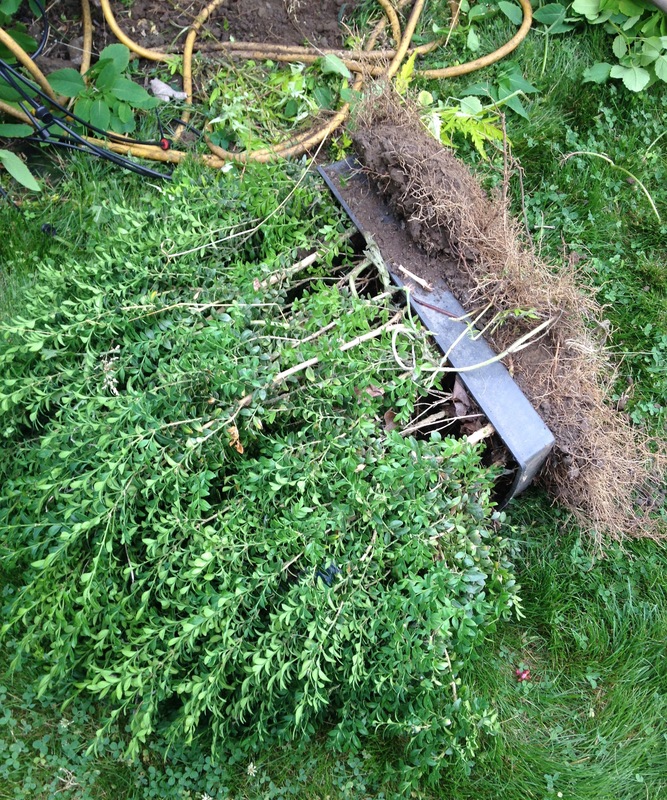 Fortunately boxwood is pretty hardy stuff and survived all this abuse with only minimal damage, and you can at least say the cuttings are very well rooted… which wasn’t much of a plus as I ripped apart the nursery tray trying to get them out. Lets wrap things up though. I feel this year there’s been a near heroic effort to keep weeds at bay at this end of the yard, especially since I just can’t figure out what to plant here. The soil gets too soggy in the rain to grow iris well, delicate flowers are destroyed during kickball games, and overly lush plants are often bushwhacked when looking for lost tennis balls. From a distance, with a neat edge on the bed, at just the right angle… many of this bed’s flaws become easier to ignore. Lets also ignore the beds around the back porch. They still need some ‘vision’ but for now as long as the most rampant weeds are kept at bay and the Virginia creeper is regularly beat back off the porch it’s a generally non-offensive area. Still a work in progress going around to the north side of the house. 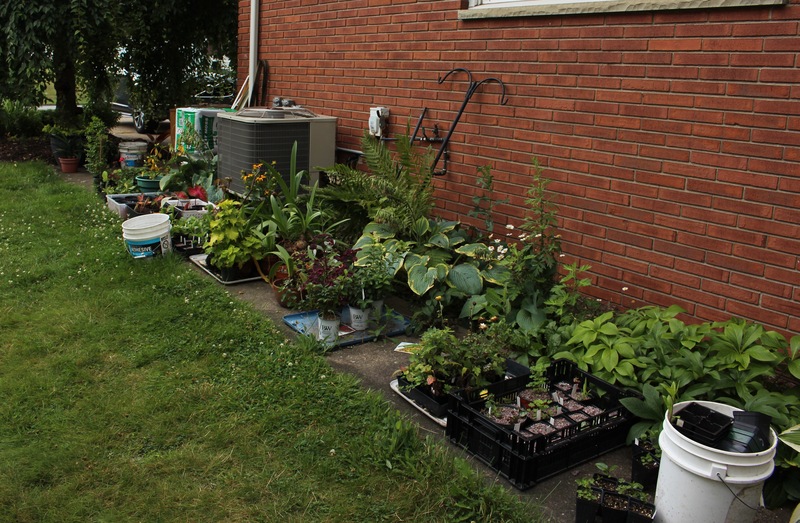 We end our tour by coming around the garage and passing the ‘pot ghetto’ where all the least fortunate plants-in-waiting bide their time until the gardener makes up his mind on a location. The gardener is not sure what the holdup is since all the other perfectly placed plantings really haven’t stood the test of time, but he likes to think someday inspiration will strike. Studies show that inspiration usually strikes the day before a two week road trip, but until that happens the plants wait. So that brings us back around to the front of the garage again. 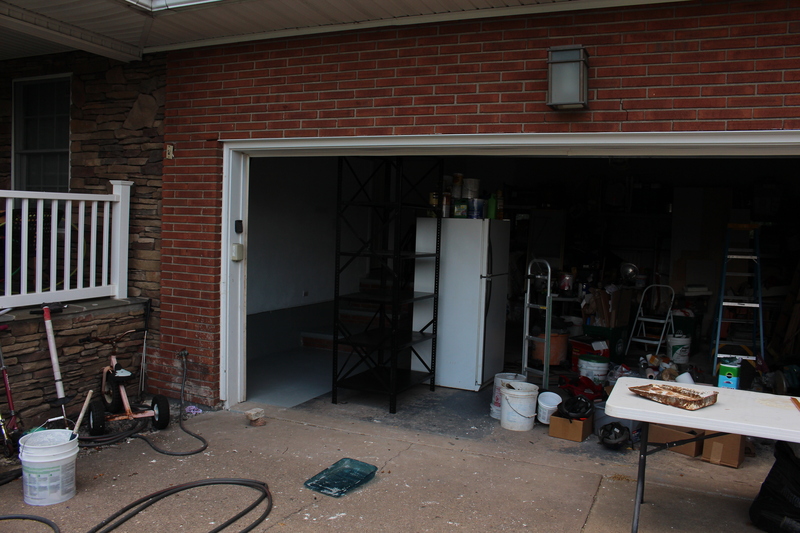 It doesn’t take a genius to realize that nothing has changed in terms of garage cleanup since we started, but it being a day of rest I think that can be overlooked into tomorrow. For now I want to thank you for coming along and feel free to stop by if you’re in the area. Just be ready. If you think this post went on for way too long imagine what the real on-site experience is like! 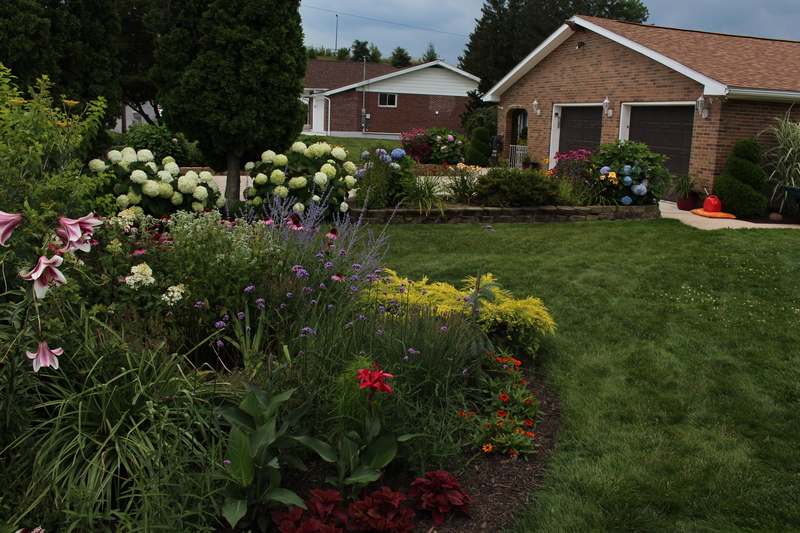 This entry was posted in garden tours, phlox, summer, Uncategorized and tagged garden, garden tour, Summer, summer flowers. Isn’t it amazing how things keep coming and going in spite of the weather and other mishaps? Last year I thought the whole garden was a disaster and spent most of the summer next door at the pool (the only reasonable reaction) but this year I feel like it’s a garden again. I’m surprised you think it’s bigger, I guess seeing it every day gives me a much different perception. What a nice tour. It is fun to be able put into perspective all the wonderful pictures you share. I even think your ghetto is even neat. I am sure ‘VISIONS’ will occur to remedy all of your complaints. That cache of boxwood starts is epic. 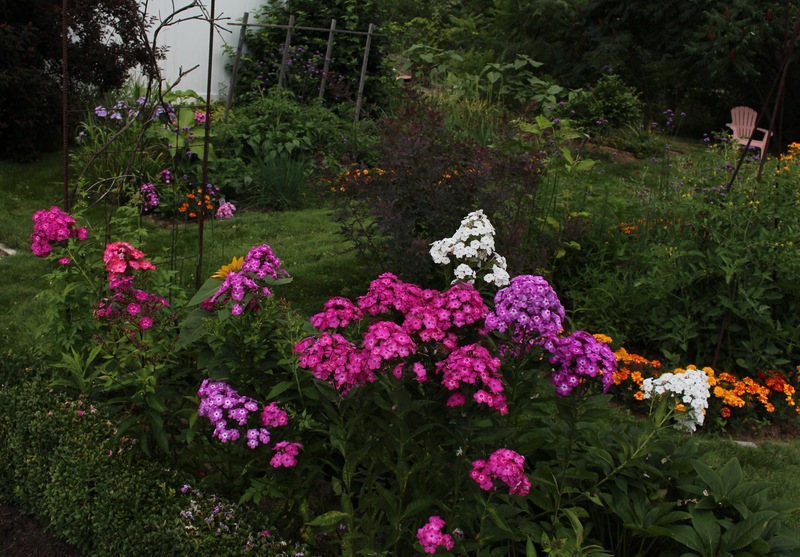 You don’t need to apologize about the phlox. It is one of my favorites too. I love that smell. I don’t have a lot of them but the ones I have are very fragrant. Cheers. 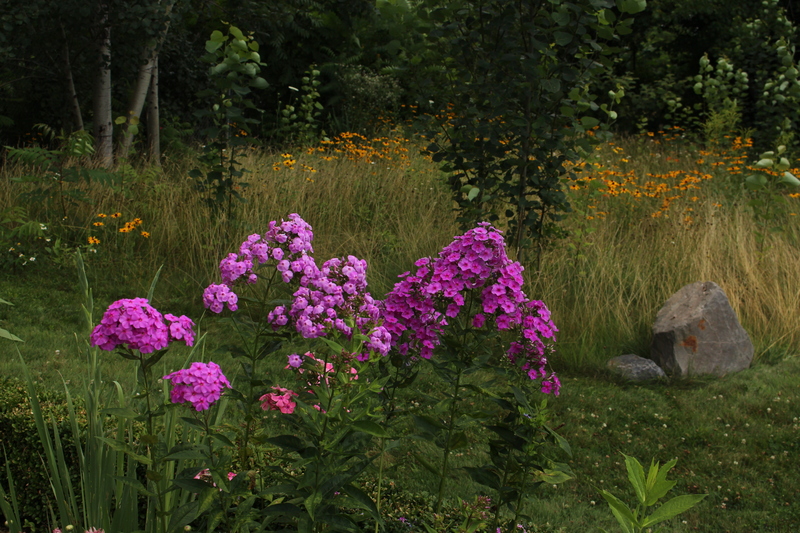 At this time of year I could easily fill half the garden with phlox. It doesn’t particularly like my garden but I force it to stick around and hope someday I’ll find a good spot. Thoroughly enjoyed the tour, Frank. Wow, last year sure was dry, a striking contrast to this year, which I’ve been enjoying in its lushness. It really looks neat and tidy and I wonder how you find to take care of it all, plus work and have family time. The neat and tidy is already fading. It helps when you have ample time off during the summer, few friends, and no guilt in ignoring the family. Plus I learned I can trick the kids into mowing the lawn every now and then! 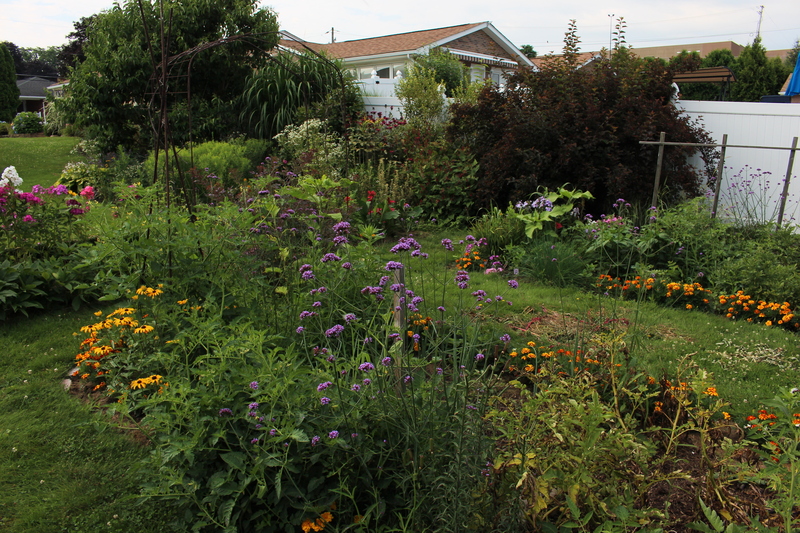 The garden will be on its own in August though. I’ve had my fill of this for now, and once the mulch is down and the drip lines turn on there’s little I want to do other than dig a few bulbs and take a few cuttings and sit back! Your garden tour was great! Everything looks so nice and the mulch finishes it off. I have a place next to my garage that still houses some plants I can plant in fall. There is always something to do in the garden. 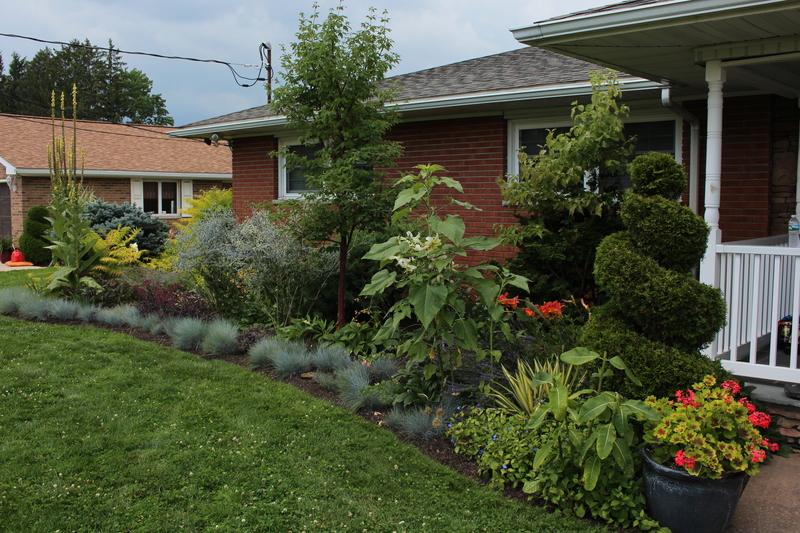 Thanks, having the garden looking so neat is a first and I hope no one expects this to be the new norm! For the next month or two I’m scaling back and just watching things grow and develop. The weeds will be easier to pull after they grow a bit. Thanks for the tour–and for linking to my tour. It’s amazing how trim little boxwood hedges give the illusion that Someone is in control. I love that you have a rock garden with no rocks and a non-rock garden edged with rocks. In that wet area, maybe Japanese irises or Queen of the praire or Joe Pye weed. The JI might be too delicate for soccer balls, but the other two could take it, I think. PS Guess what I did this week? Dug up 300 daffodil bulbs! What a story! I should write a blog post! Maybe I will. The real question is: where am I going to replant them all? The other problem with my soggy bed is how dry it gets in a normal summer. 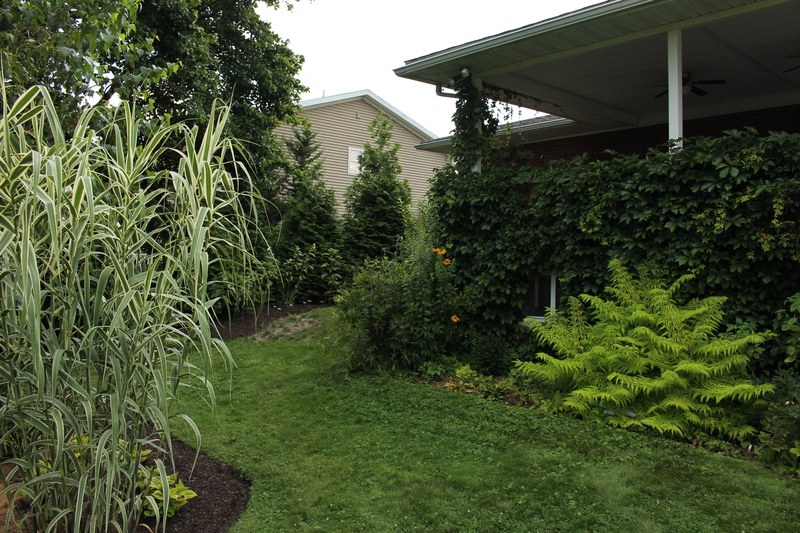 I think what it really needs is good soil prep… but it’s also within the root zone of some red maples, so any soil improvements seem to go straight up their trunks. Japanese iris can probably take it though. They only bloom for a few weeks, so maybe I can distract the kids elsewhere for those days, and summer dry shouldn’t cause too many problems for them. btw I’m upset about you digging all those daffs. I was planning on digging a few hundred of my own and need to ship them off to other unsuspecting gardeners so that they can do the replanting! I don’t think I like that you read the blog now, lets hope it’s just a phase. Loved getting to see the whole shebang! What a lot of things you have happening and in lots of places which means lots of edging and mulch. No wonder you are exhausted. I always make garden visitors leave through the side of the house that is the work area/plant and pot ghetto. You always need to see where the magic happens. And I love those little hedges and now may have to take boxwood cuttings. I know I have a spot where I can leave them to ripen for five years! How funny, I look at your immaculate plantings and it makes me exhausted! 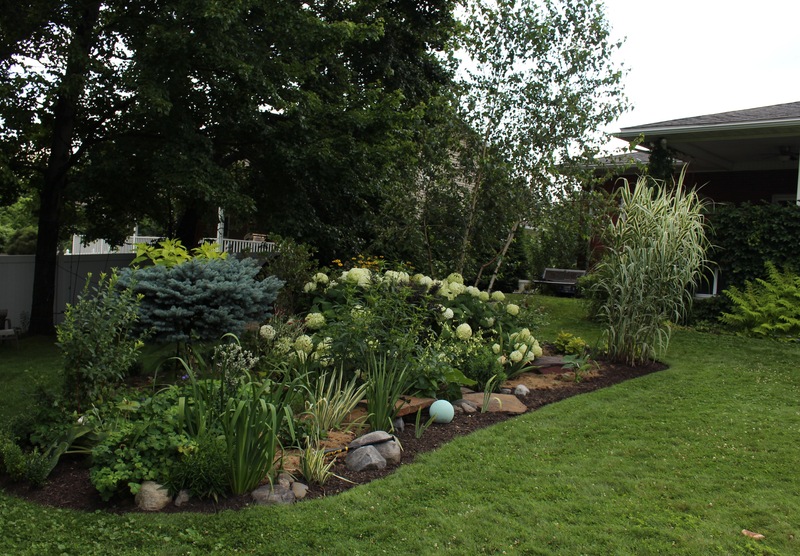 I was admiring the new raised beds on Nancy Ondra’s blog and think I might need to come up with something similar for my own garden. Like you pointed out there’s an awful lot of edging, and it’s messy edges that really make a bed look neglected. That and ground covers 🙂 -as soon as I find some ‘tamer’ ground covers I’m switching to some of that! Thanks for the tour, Frank! This was really helpful to piece together the individual garden parts you’ve posted previously. 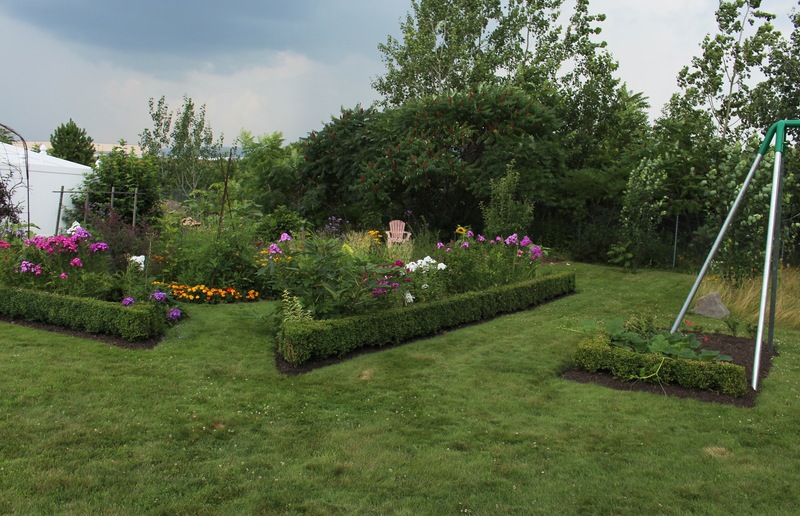 Your garden is wonderful and the boxwood cutting comments made me laugh out loud. Everything is looking really great and your hard work with the mulch really shows. I’m envious of your perfect green lawn. All plant-obsessed gardeners have pot ghettos/work spaces! Phew, I thought for sure there would be a bunch of gardeners politely reminding me not to buy things I have no spot for, or to make sure new plants get in the ground the same day they’re bought. I think you can appreciate the NEED to get a certain plant when you see it! Enjoyed seeing all aspects of your garden. Really impressive and I love your phlox. Thanks! The phlox are really my favorite right now. Haha, roots like that deserve something, right? Oh, I wish I could grow phlox here! I’m so envious of yours! I love your boxwood borders, too. Trying to figure out where I could do such a thing in my own garden. How did I miss that new lawn section near your back deck the other day? Quite the clean up you did there! Finally, I do get a good chuckle out of your rock-less rock garden! I think your whirlwind tour was a little too fast for catching dull things like yawn… I mean lawn… at least it wasn’t raining, and no snakes either! I suspect a deer went through last night. There were missing leaves here and there and I think I saw a track. I don’t like this one bit and will be pricing fencing. My phlox need protection! A deer ventured its way to the far end of my rock garden yesterday and ate most of the flowers off of one of the gomphrenas before I burst through the back door screaming like a mad woman! I’ve never seen deer come in there before–always thought the topography of the yard kept that area safe! Arghhhh!!!! !